this stranded wire is suitable for closed loop control and rigging wires for biplanes etc. It is available in 30, 50, and 75 lb strengths. 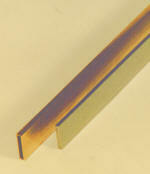 flat steel strip, (3 x 15mm), in a rectangular brass tube. This strip is commonly used for joining glider wings where light weight and high strength are required. The steel strip is a very accurate fit in the brass tube. a rigid laminated plastic useful for engine mounting and making control levers etc. Can be sawn and drilled with ease. The sheets are 105 mm x 150 mm (6 x 4") in various thicknesses. extremely tough spring wire for linkages, undercarriages, etc. Sold in 3 ft (914 mm) lengths. useful for various brackets and cabane struts etc..
in 300 mm (12") lengths. Note that the 10 gauge slides in the 8 gauge, and the 8 gauge slides in the 6 gauge. This can be useful. available in two strengths, 24 lb and 36 lb breaking load. Both wires are stranded.